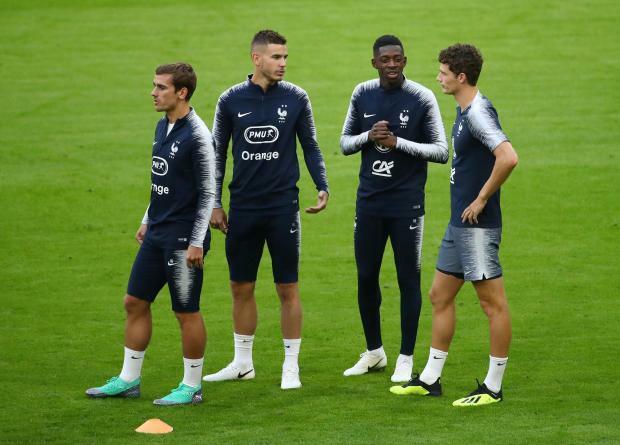 France's Antoine Griezmann, Lucas Hernandez, Ousmane Dembele and Benjamin Pavard during training. Germany are a world-class team despite their early World Cup exit but France should have the advantage when the sides meet on Thursday, French coach Didier Deschamps said on Wednesday. The French, who won their second world title in July, take on hosts Germany in the inaugural Nations League competition, their first game since the World Cup final against Croatia. The Germans suffered a shock group-stage exit at the World Cup, their earliest in 80 years, and coach Joachim Loew is under pressure to turn things around quickly for the four-times world champions. "Germany were world champions. Germany were favourites at this World Cup as well," Deschamps told reporters. "It did not work out for them but the quality is there. They remain a top level team. I have a lot of respect for this team and for what it represents." But Deschamps believes that France, playing with all their big names in Munich including Kylian Mbappe, Antoine Griezmann and Paul Pogba, should have the edge. "This title should give us power, power that gives us confidence, power that feeds us," he said. "Physically it is the start of the season and some of my players have started later. It was short preparation and in a month it would be better. "It will be difficult but we have the advantage with the confidence capital from the title." France will be without captain and goalkeeper Hugo Lloris in the first game of the new tournament designed mainly to replace friendly internationals. But for France defender Raphael Varane little has changed within the team. "We do have a special status but I don think the second star on the shirt is too heavy," Varane told reporters. "It does not change our match preparation. We will keep the same values and ambitions. "We cannot under-estimate Germany. They are as great team with great players and they will look to be as efficient as possible tomorrow."